Is the heavy footfall spoiling your flooring? Or is the vehicular movement causing more damage to the tiles? Whether the flooring is not able to protect the oil spill or the harsh chemicals and acids, the solution is only one. The professional expertise from the team of Florida Epoxy Pros ensures that the flooring can withstand the onslaught of any external causes, which reduce the life of the flooring. One of the fast-growing industrial markets in Florida State is the Tampa Industrial Market, which absorbed more than 82,500 square feet of industrial space during the Q3 of 2017 as per the Newmark Knight Frank’s Research. We are very proud that we are associated with the high performance of floor protection and floor coating in Tampa Market and surrounding areas. If you need some insight into our specialization in polished concrete flooring, you are on the right page. Let us flip through the salient features right away. It is not everyone’s trait to perfect the art of polished concrete flooring. We could achieve this after sustained efforts of dedicated service to the field. The impressively designed polished concrete flooring is very durable and does not demand additional coating and expensive covering. Today, we are at the forefront of the market because of the sincere and experienced team of professional guiding the technical team. There is no denial that concrete is very strong and therefore, has multiple advantages. You can use either for a home environment or in business houses or the industrial markets. The hard material of the concrete is preferred for laying the driveways or the streets where heavy traffic is envisaged. If you desire to prevent any scratch or a dent to the flooring, the material that strikes to everyone’s mind is concrete. The impressive design in combination with the qualitative product is the unique attraction of the flooring. The permeability of the oils and other liquids is prevented, and therefore, the flooring does not warrant any sealing. The non-porous nature of the material does not allow any spill absorbed by the tiles. The design of each of the tiles is exclusive to itself, and you do not find any repetition of the design on any tile. This unique quality is well appreciated by the beholder. The harsh chemicals do not damage the flooring, and therefore, the concrete flooring is ideally suited for the industrial areas where the slackness of handling the materials does not damage the flooring. If you are of the opinion, that the concrete is meant for only industrial use and not ideal for the domestic use, probably you need to think twice. No doubt, the concrete is heavy. You can enhance the ambiance with the concrete flooring at home too. However, if you are thinking of installing concrete over a subfloor, probably it is a matter of concern. You can take the opinion of a structural engineer or alternatively, you can opt for the lightweight concrete. Not all concrete designs are ho-hum. You can obtain luxurious multiple design patterns to suit anyone’s taste. 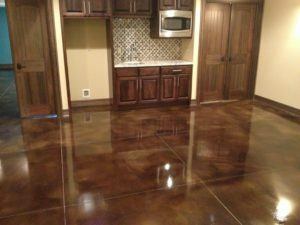 In fact, there is an unlimited choice in obtaining very fascinating designs if you add dyes to the wet concrete mixture. You might be surprised to know that if you are fascinated with the ceramic tiles, you can replicate concrete flooring into ceramic flooring. You can simply stamp the concrete flooring with a rubber stencil to give it an appropriate texture. The right mixture of dyes and other coloring agents would be eye-catching mimicking the ceramic tiles. When the specialized team from Florida Epoxy Pros seals the concrete floor with perfection, the floor shrugs off the dirt, spills or other hard impacts. What it requires is only a mopping with a damp cloth after the necessary sweeping of the dirt or grit. The hardness of the material adds the necessary strength to the flooring, which enhances the durability. The non-porous nature of the material does not allow any oil or other liquids and other contaminants to permeate to the inner layer of the concrete. Therefore, there is no discoloration of the flooring even when there is an oil spill. If the traffic includes the movement of mini-trucks or other running vehicles including the forklifts, etc., does not leave any imprints of tires. You can simply wipe off the marks, and the flooring looks afresh. When the job is executed through the experts like the Florida Epoxy Pros, you can expect a perfect finish without any undulation or uneven flooring. The level will be flat, and the uniform level is maintained for an impressive look. The concrete flooring is ideal when you desire to filter out the airborne dust and therefore very suitable for dry locations. Only unfinished concrete is prone to abrasions. If you opt for the polished concrete flooring, you need not have to worry about abrasion of the flooring even with heavy traffic. Other flooring’s probably need additional coatings like waxing, urethane or some special topical coatings to protect from other extraneous damages. 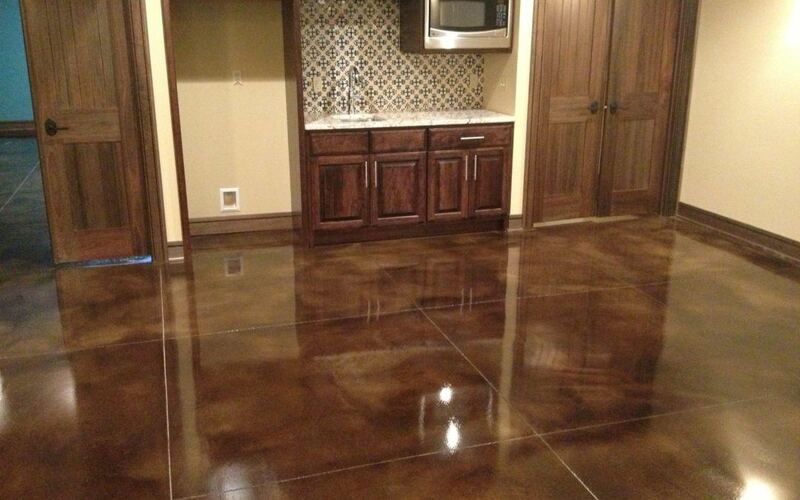 However, polished concrete flooring does not require any additional coatings, which result in savings for you. The cost-benefit analysis confirms that the polished concrete flooring is budget-friendly in comparison to other types of flooring. Florida Epoxy Pros can offer you glazed porcelain tiles too, which resembles the polished concrete tiles. Consequent upon laying the porcelain tiles, you need not have to apply any sealers. The maintenance of these tiles is very easy and pocket-friendly for everyone. The market is aplenty with Italian, Spanish, and Asian tiles offering you some fantastic trendy designs to suit everyone. With the substantial benefits of the polished concrete flooring with some impressive designs offering you durable and low maintenance flooring, the market is flooded with a variety of options. What are you waiting for? You can avail the expert service of Florida Epoxy Pros for repair and installation of the polished concrete flooring in addition to suggestions for the perfect design and other choices in conformity with your elite lifestyle in the society. To learn more about polished concrete flooring, try to read our other blog post, which is “Gym Flooring Solution that is Safe, Durable, and Attractive.” For inquiries call us at 813-328-1911 for more update about polished concrete flooring.